Too many new eager Tesla owners make this one mistake. If you’re getting a new Tesla Model S, Model X or Model 3, avoid the same pitfall. Here’s how. There is no question that the Tesla Model S, Model X and Model 3 are luxury cars. Yes, they save you money on gasoline. That however, doesn’t make them economy penny-pinching automobiles. Tesla cars fill a very new niche of vehicle. This niche shares some very distinct qualities with many other electric cars in terms of fuel-savings and progressive clean energy. In any event, Tesla cars do this, at the luxury end of the spectrum. In other words, you get a lot of the same benefits of budget electric cars, but you get to enjoy them in a luxury package. As is the case with all luxury cars, the need for care and protection grows as the price of the vehicle increases. This is not simply from an economical point of view, but also from the pride of ownership perspective. Wanting that Tesla Model 3 to look as good in 3 years as it looks now is a big part of enjoying your Tesla ownership. Now, there’s a big mistake that most car buyers make when they buy a new car, Tesla car buyers included. While they’re busy signing the papers, the dealership is at work on getting the car ready. They remove all the packaging materials that come with the car from the factory. They install the floor mats, wash it for you and then hand it over with the keys, an owner’s manual and a lame shameless plug dealer plate on the back. At that point, you feel that you are done. It’s time to enjoy the car. I mean, after the money paid, that’s what you’d expect. But no, you’re not done. See, the dealer pretty much washes their hands at that point. They made the sale and you are responsible for the car from now until the time you get something else. Most people don’t know it, but go look at any 2 year old car and you will see that it has freckles. Yeah, it has a wide array of tiny pinholes all over the front end. When the car was first bought it was not like this. Here comes the takeaway… You can have your Tesla’s finish look like it did went you first pulled out of the dealership, two years later. But you have to do something about it the second you leave the dealership. The mere act of driving it around, even carefully, will earn you a collection of rock chips. Have paint protection film installed. No, this is not simply a sales pitch. Let’s take my truck for example. It’s worth new about half of what a new Tesla is worth. What does it have? You guessed it. It has the entire front end protected with paint protection film. In fact, every new car I buy will always get paint protection film. Here’s the thing though. Paint protection film isn’t cheap. The standard front end package for a Tesla Model X costs $1850. It’s basically the same for a Model S and a Model 3. You need this though, if you expect to really enjoy the car. You can enjoy it without constantly having to worry about getting it chipped up when driving it. This $1850 should literally be part of your budget when you are buying a new car. The materials alone are expensive, but a lot of the cost is the labor as it’s something that is nearly impossible to do right without a good amount of experience. It’s important to note what I said earlier about Tesla’s being luxury cars. It might be easier to just let it slide and not protect a Chevy Volt. But once you step up to Tesla territory, protecting that finish is a no-brainer. You don’t want to have to look at the front end of that Model X in 2 years, or even a year, and cringe at all the pitting from rock chips. If you want the ultimate protection you can go as far as wrapping the entire car. Many Tesla owners do this. The grunt of the road hazards tend to attack the front end of the car, but scratches and rock chips can happen to any part of the vehicle. You know that truck I mentioned earlier? The entire front end is protected. I hear pebbles bouncing off it all the time and I don’t even worry. However, just recently one flew up high enough and put a nick on the roof. I looked at the PPF on the hood and wished I had some on the roof too. Full body protection is worth it on luxury cars. At Protective Film Solutions our specialty is the installation of paint protection film. We work on the world’s most exclusive vehicles. Don’t let that scare you. Our bread and butter is the daily driver luxury vehicle. We price our work very competitively for that market. Just because we work on hyper cars doesn’t mean the mid-range luxury car work needs to be too expensive. After all, those are the cars that see the most drive time. Not the weekend-only super cars. You might be planning on buying a new Tesla. Or maybe you’re already waiting on the delivery of a new Tesla Model 3. Make sure to start planning now and make an appointment with us ahead of time. That way, when your new Tesla is delivered, you can resist the urge to hit the open road immediately and bring it to us first for paint protection. That way you can really enjoy that first road trip knowing that rocks are not going to ruin your new shiny finish. Special thanks to STRUT for the Ted 7 images of their Tesla Model S creation. 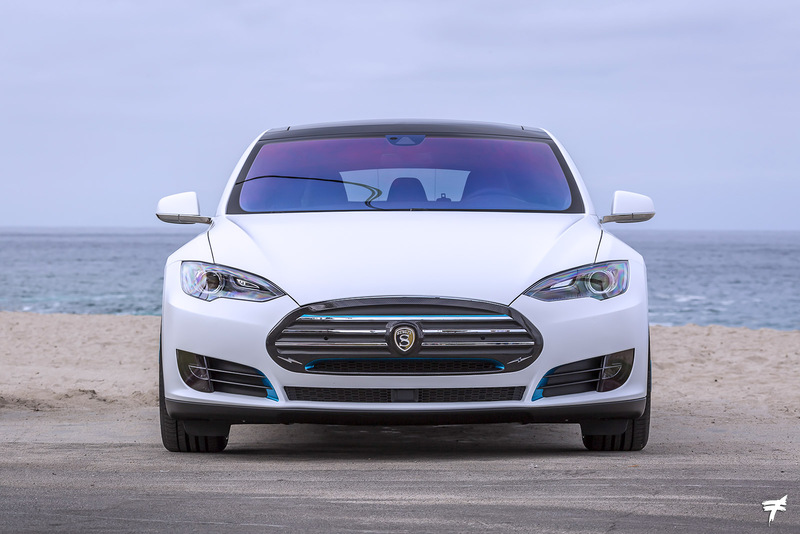 Request a Free Quote to Protect the Finish on Your New Tesla Today! Interested in coating the PPF with Glanz Ceramic.